How climate change could alter life in the Puget Sound region is the focus of a new report from the University of Washington’s Climate Impacts Group. 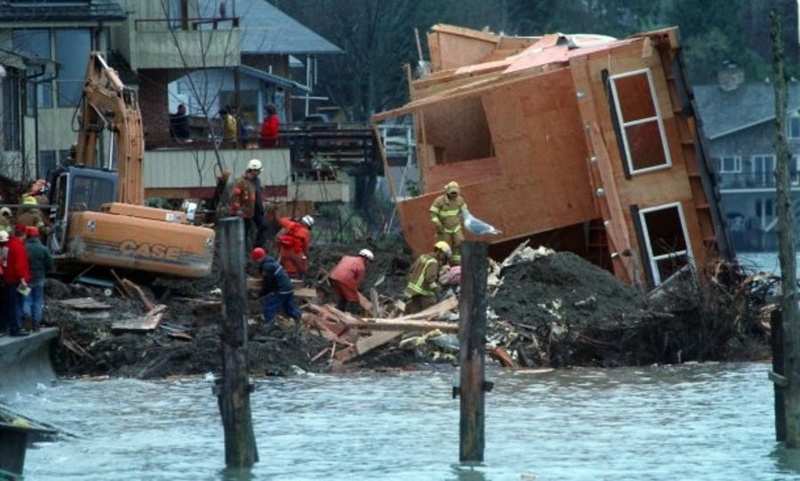 A 1997 landslide on Bainbridge Island killed a family of four and resulted in five homes being condemned. Landslides can be expected to increase in the future because of changes in precipitation patterns. In concert with the report’s release, I’m writing three stories for the Encyclopedia of Puget Sound, all focusing on specific aspects of the report, beginning with landslide risks. See “Shifting ground: climate change may increase the risk of landslides” on the Puget Sound Institute’s blog. As the new report describes, increased flooding, more frequent landslides and decreased salmon runs are likely, along with declines in some native species and increases in others. We are likely to see more successful invasions by nonnative species, while summer drought could cause more insect damage to forests and more forest fires. The report, “State of the Knowledge: Climate Change in Puget Sound,” pulls together the best predictions from existing studies, while updating and expanding the range of topics last reported for Puget Sound in 2005. The report includes examples of communities taking actions to prepare for climate change, such as merging flood-management districts to prepare for increased flooding in King County and designing infrastructure to contend with rising sea levels in other areas. “In the same way that the science is very different from the last report in 2005, I think the capacity and willingness to work on climate change is in a completely different place,” Mauger said. Sheida Sahandy, executive director of the Puget Sound Partnership, said the people of Puget Sound must be prepared for changes that have already begun. Work to compile the report was funded by the U.S. Environmental Protection Agency via the Puget Sound Institute at UW Tacoma, the National Oceanic and Atmospheric Administration and the state of Washington. The report will become part of the Encyclopedia of Puget Sound, where my climate-change stories will reside after publication over the next three weeks. I’m currently working part-time for the Puget Sound Institute, which publishes the encyclopedia and is affiliated with the University of Washington — Tacoma.